It’s not often you see even one set of triplets here, but recently the Creation Museum was blessed with visits by two sets of triplets! 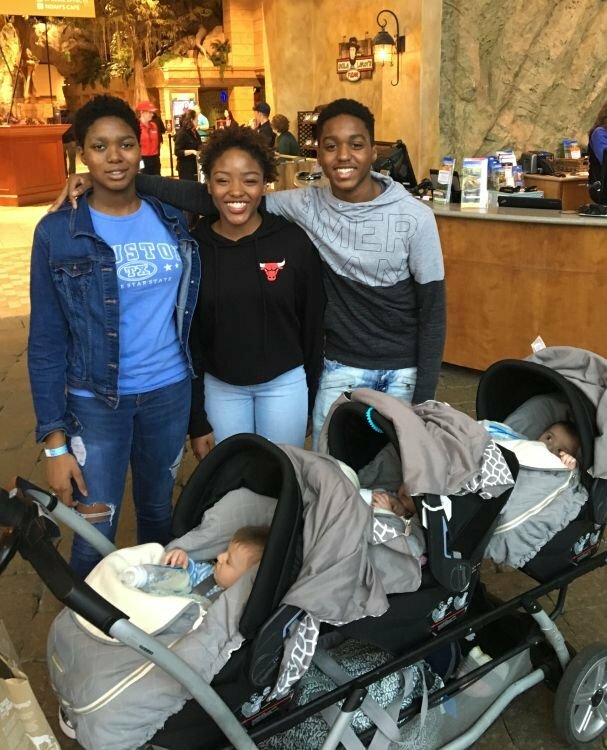 These families didn’t know each other, but when three teenagers saw three babies cruising around in a triple stroller, they stopped and said hi to the parents—explaining they too were triplets. Two sets of triplets recently visited the Creation Museum. The young ones (just seven months old) are new additions to a Navy family taking in both our attractions. The teenagers are from a retired Army family enjoying their Spring Break. So, these families had two things in common! We want as many individuals and families as possible to visit our attractions and hear the message of biblical authority and the gospel. We love hosting kids here at the Creation Museum and Ark Encounter. And we’re thankful for our veterans. We offer free admission to children ages four and under to both attractions, and older children and most teens always enjoy special pricing. We also offer a Family Voyage vacation bundle that allows your whole family to visit either attraction as many times as you want over seven consecutive days. We want as many individuals and families as possible to visit our attractions and hear the message of biblical authority and the gospel. And, as our way of saying thank you to those in military service, we also offer a 20% discount to active duty members of the United States Armed Forces. This discount allows them to purchase up to 5 general admission tickets (adult or senior) at a discount when they show their current military photo ID. Retired or veteran service members enjoy a 20% discount on their ticket. And US veterans always enjoy free admission on Memorial Day, Independence Day, and Veterans Day. We enjoyed seeing thousands visit the Ark Encounter and the Creation Museum this Spring Break season. It’s been a busy time. Come visit Northern Kentucky and see what all the excitement is about. Learn more at CreationMuseum.org and ArkEncounter.com.